October is the start of flu season. It’s also the time of year when people have questions about flu shots and flu prevention. To clear up some common concerns, here are some of the most common myths about flu shots, along with the facts. Myth: You can get the flu from the flu shot. Fact: This is simply not true. In fact, it’s impossible. Even though the vaccine used in flu shot injections contains no live vaccine, this is one of the most common myths about flu shots. Some people report that they became ill after having the shot, but they had probably already been exposed to whatever made them ill.
“It’s likely because something was already in their system, but they weren’t showing symptoms yet,” Valente says. It takes about two weeks for the flu vaccine to take effect, so people are still at risk immediately after getting a shot. That’s one of the reasons people are encouraged to get their flu shot early. Myth: I don’t need a flu shot because I got one last year. Fact: To be protected, you need to get a flu shot every year. There are two reasons for this. One is that a flu shot’s protection wears off over time. The second is that the flu virus changes – or mutates – over time. The vaccine is updated from one year to the next, to try to make it as effective as possible against the current flu virus. Myth: The flu shot is not effective. Fact: The flu shot does not always provide complete protection, but it is the best protection available. There are different strains of flu virus, and the vaccine does not protect against all of them. Effectiveness can vary from year to year depending on how accurately the vaccine matches the strains that are circulating that year. Myth: I eat well and exercise, so I won’t get the flu. Fact: Anyone can catch the flu. That’s why the flu shot is recommended for most people over six months old. A healthy lifestyle is very important to your overall well-being and long-term health, but flu shots and good hand hygiene are the best defence against flu. The flu virus spreads through droplets that are transported when an infected person coughs, sneezes or talks. People nearby can inhale these droplets and become infected. Infected people can also leave droplets on surfaces such as doorknobs, elevator buttons, or other surfaces that many people touch. Another person can become infected by touching these surfaces and then touching their own nose, mouth or eyes. That’s why it’s so important to clean your hands frequently and use hand sanitizer. 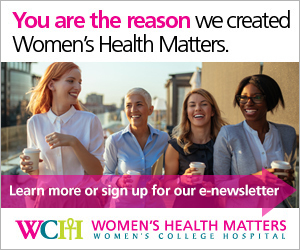 “Two things we really promote here at Women’s College Hospital are good hand hygiene and getting a flu shot, because in healthcare the rate of getting flu is much higher than in other workplaces,” Valente says. Myth: The flu is no big deal. Fact: Flu can be a serious illness. Valente notes that complications that can arise from flu include pneumonia, hospitalization and, in rare cases, even death. According to the Public Health Agency of Canada, there are about 1 billion cases of flu worldwide every year, and 3 million to 5 million of those cause severe illness. The flu kills between 250,000 and 500,000 people worldwide every year. The most vulnerable groups include people over age 65 or under age 5, pregnant women, and people with other health conditions. Even in cases that don’t become severe or life-threatening, the flu is very unpleasant and usually lasts 10 days to two weeks. Another thing to consider is the possibility of passing the flu virus to someone more vulnerable. “You can pass it on to a family member, a colleague or a member of the public,” Valente says. Myth: Pregnant women should not get a flu shot. Fact: Canada’s National Advisory Committee on Immunization (NACI) notes that pregnant women are at increased risk for complications from flu, and recommends flu shots for all pregnant women. Flu shots by injection are safe in pregnancy. In fact, NACI notes that vaccinating pregnant women protects against flu in their newborns (who cannot be vaccinated against flu until age six months). Flu shots will be available to everyone in pharmacies and health clinics across Ontario starting Oct. 24, 2016.